I hope everyone had a wonderful Mother’s Day with their moms/grandmoms! We had a very nice day and made a special cake that we will be blogging about later this week. I meant to blog about this last week as a Mother’s Day brunch treat, but things got very busy with AP tests and a bunch of other things that it didn’t happen. No matter- it’s never too late to post about a cake as fabulous as this one! Some readers may remember that we made a cinnamon gooey butter cake last year. It was fantastic, but this one is even better. The base is a sweet yeasted base that is a cross between the texture of cake and a cinnamon roll sort of dough. The topping is buttery (of course!) and filled with vanilla flavor. The edges of the cake caramelize and are my favorite part, but you can’t beat the gooey topping either. This cake is fabulous! In a small bowl, combine milk with 2 tablespoons warm water. Add yeast and whisk gently until it dissolves. The mixture should foam slightly. Using an electric mixer with paddle attachment, cream together the butter, sugar and salt. Scrape down sides of bowl and beat in the egg. Alternately add flour and the milk mixture, scraping down sides of bowl between each addition. Beat for several more minutes until the dough is completely smooth. Press dough into a 9-by 13-inch baking dish (we sprayed ours with cooking spray) at least 2 inches deep. Cover dish with plastic wrap, put in a warm place, and allow to rise until doubled, 2 1/2 to 3 hours. Heat oven to 350 degrees. In a small bowl, whisk corn syrup with 2 tablespoons water and the vanilla. Using an electric mixer with paddle attachment, cream butter, sugar and salt until light and fluffy. Scrape down sides of bowl and beat in the egg. Alternately add flour and corn syrup mixture, scraping down sides of bowl in between each addition. Spoon topping in large dollops over risen cake and use an offset spatula to gently spread it in an even layer. Bake for 30 to 45 minutes. The center will still be liquidy when done (don’t overbake), but the top will have turned golden brown. Allow the cake to cool in the pan before sprinkling with powdered sugar for serving. Cut into slices and serve. Enjoy! Seems great. I’ll surely try.. Thank you! The peach cake looks delicious. 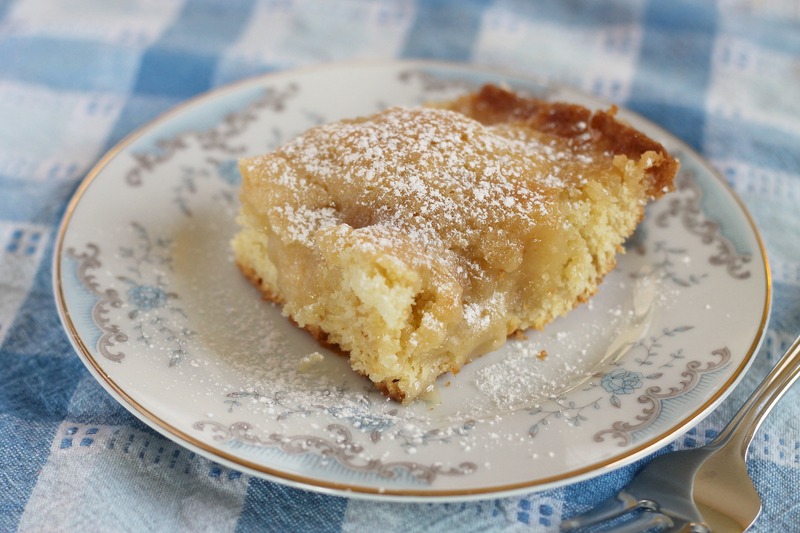 Love some gooey butter cake – yum!